The Cogswell interchange was built in the 1960’s as part of a plan to build a highway through Downtown Halifax. The City never constructed the highway but the interchange was built, and still stands today. The interchange takes up space that could be better used to physically and socially connect the North End of Halifax with Downtown Halifax. 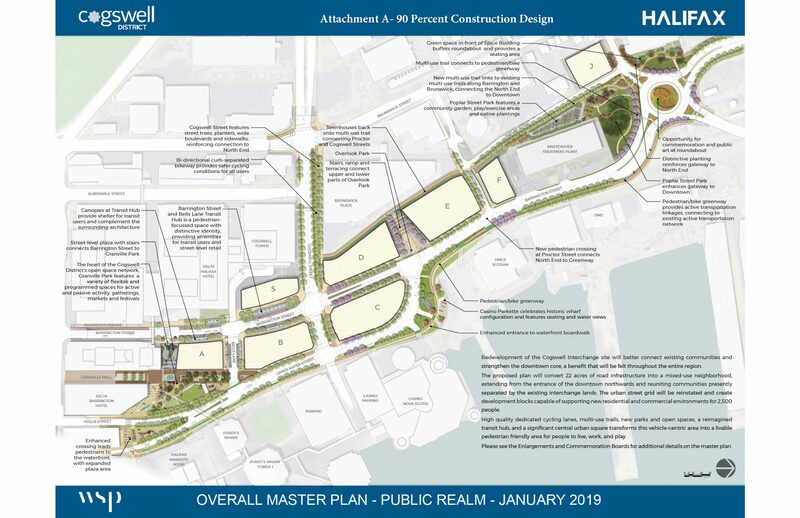 Halifax Regional Council approved a concept plan to demolish the Cogswell interchange in 2014 and by June 5, 2018 Council approved the 60% design for the Cogswell District Redevelopment. Now, on February 26, 2019 Council has approved the 90% design for construction in Fall 2019. To learn more about HRM’s plans for Cogswell visit their website here. Following the release and approval of the 60% design we felt that it did not meet the original principles set out for the district. We were not alone in this, many people and organizations felt there was a lack of public engagement and consultation leading up to the release. This was recognized by the Halifax Regional Municipality and community engagement was enhanced during the summer and fall of 2018 leading up to the 90% design. Also during this time, 16 organizations involved in the discussion of the Cogswell redevelopment, plus HRM, hired and funded New York and Copenhagen based urban design firm, Gehl, to research, collaborate, and produce a Cogswell District recommendations report. The Gehl report is now complete and available for download. To download the Background and Summary, click here. To download the Goals Matrix: Evaluation, click here. We are particularly concerned with principle 5 of the vision for the Cogswell District, to prioritize active transportation. While there are separated bike paths and off-street trails included in the 90% design, the street design is still focused on moving vehicles and trucks quickly through the Cogswell District into and out of Downtown. Hundreds of trucks travel on Hollis and Lower Water Streets daily to move goods from the Port of Halifax in the South End of Halifax. The current plan assumes that all of these trucks will drive through the new Cogswell District. Heavy truck traffic creates noise and reduces the quality of public space in the surrounding area. It is not pleasant to sit on a cafe patio with hundreds of transport trucks driving beside you. The scope of the Cogswell District planning process does not include re-routing truck traffic, but the trucks need to be routed out of our Downtown to create a place where residents and visitors want to spend time. We would like to see the Cogswell redevelopment catalyze a larger conversation about moving truck traffic out of Downtown and we think the success of the redeveloped Cogswell neighbourhood depends on it. The plan also includes a multi-use trail along Poplar Street, which is not the best type of facility for people walking or biking. People walking and people biking would be able to move more smoothly and safely if there was both a sidewalk and a bike path. We look forward to working with HRM through a public engagement process to address our concerns and to ensure that the Cogswell District is a well-connected neighbourhood with high-quality bike lanes that make it easy for people of all ages and abilities to travel by bike.